Helen Razer is a well-known writer and newspaper columnist. Like so many of us she has Muslim friends, mostly women, who were targeted and harassed by hateful bigots. So she wrote a response. We loved her powerful response to the tide of Islamophobia that is both encouraged by and threatens to overwhelm social media. And we remind people that there is an enormous gap between critiques of all religions and vicious, ignorant and violent attacks on the adherents of minority faiths. We also note that attacks on Islam by bigots are usually gendered attacks by the same cowardly morons who would figure as perpetrators of misogynist attacks on women generally. Well it seems like our bogot friends either haven’t read this statement nor have they understood it. We still get loads of rubbish like this on social media. 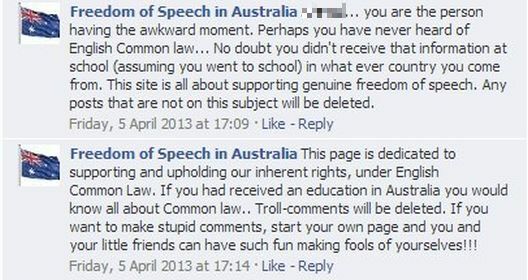 He doesn’t want a bar of “free speech” because it’s not his sort of “free speech”. So he urges his followers (?) to go over to a Facebook page and trash it. 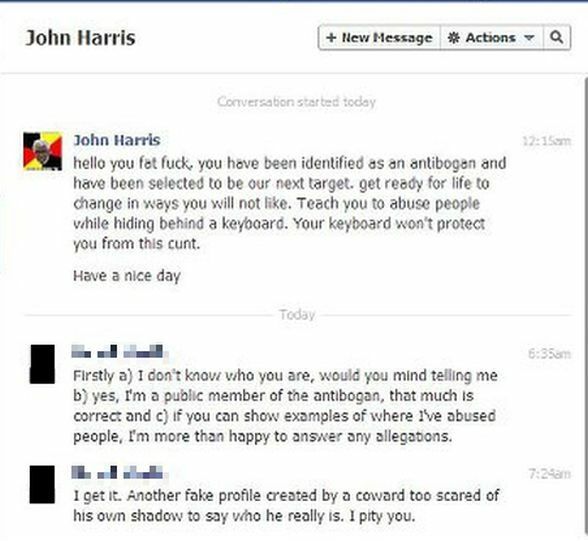 Then we get the ever-present attempts to intimidate people on pages the bogot doesn’t like. and this from Twitter. 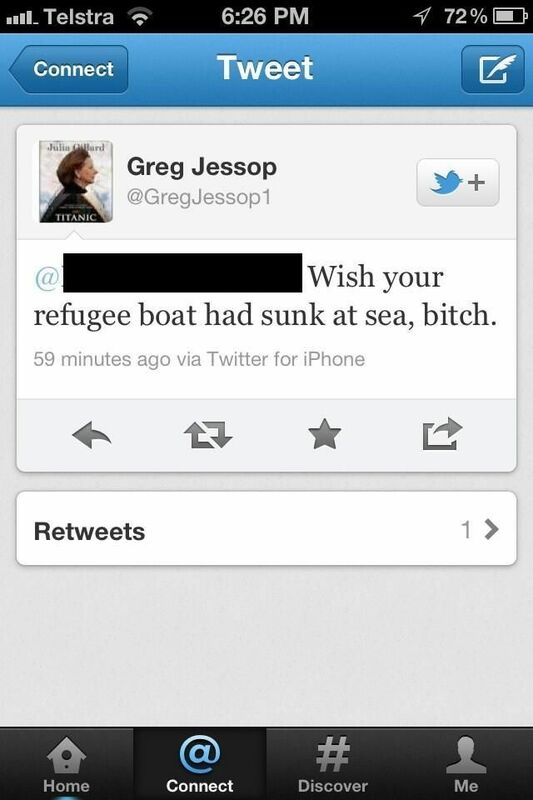 We’ve met “Greg Jessop” before. Yet just listen to them going on about “the law” and their “rights”. Now this Freedom of Speech group (in actual fact- surprise surprise – an anti-Muslim group) has an admin who fancies itself as a legal expert. Its rant is directed at someone whose identity we have chosen to conceal but who has an Arabic name. Note the patronising tone and the assumptions made. After FreeSpeech has pontificated about its opponent’s supposed lack of education (obvious – after all he is “teh_moooslem”) the pwnage begins. 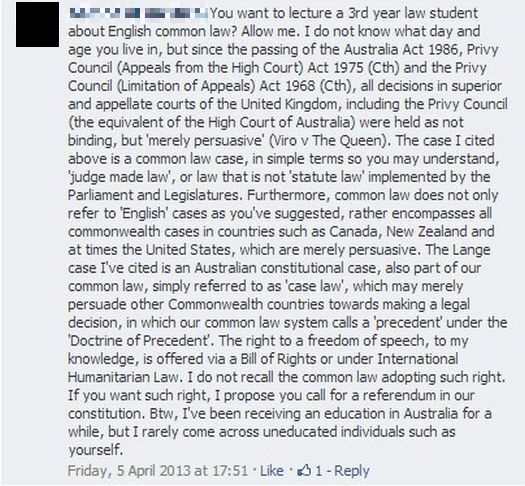 We predict a great future for the law student – perhaps on the Bench? The future of hate speech FreeSpeech?